The Rebel Alliance sends criminal Jyn Erso with an intelligence officer, Cassian Andor, to retrieve an Imperial defector who’s being held by an extremist named Saw Gerrera. Not coincidentally, Saw raise Jyn after her father, Galen Erso, was forced to return to Imperial service as a weapons designer and her mother was killed. The Alliance also wants to find Galen, who turns out to be one of the prominent figures behind the design of the Death Star. Brief opinion: Far better than The Force Awakens, and that is entirely due to the last third of the film. Let’s do this in reverse. Usually I talk about the good points, and then move to the bad before ending with the miscellaneous, or move from the good stuff to the miscellaneous then the bad. I shall begin this one with the things that I didn’t like or that I thought didn’t work. Donnie Yen’s casting in this movie was the reason so many people I know were excited about this movie. I don’t know how they’ll feel about his character, but I thought he was underused and his character was reduced to a faint, faint echo of the Jedi. He’s not a Jedi, and his Force-sensitivity is up for debate, although he certainly believes in the Force. But it felt as though half of his lines seemed to consist of the chant: “I am one with the Force, and the Force is with me.” This got boring after a while. Upon second viewing, he does come across as certainly Force-sensitive though not a trained Jedi. I also wonder if his limited dialogue was at least partly due to perhaps lack of fluency in English. Did not like the council scene where Jyn tries to make the case for attempting to steal the Death Star plans from the Imperial archives on Scarif. Her impassioned plea to try and to hope felt… Annoying? I think I would have preferred to have her discuss it with, say, General Draven, and then have Draven and the rest of the council sit down and discuss the matter without Jyn or Cassian. I wasn’t sure if the scene was supposed to be the council plus a whole bunch of other random people (because there sure were a lot of people in that room), or just the council members (in which case then that’s one huge council) but having it play out as an argument and to have important figures like Mon Mothma, Bail Organa, and General Dodonna watch in silence and exchange looks didn’t seem right. My suspicion is that they wanted to give more speaking roles to minor minor characters just to show diversity. I felt it would have been a more interesting setup had it been a quiet, serious small council meeting. You can still have heated arguments in small meetings – it’s just less noisy. Why have Mon Mothma stay so silent with only a couple of brief lines? Why have Jyn deliver the “moral of the story” to people who probably do know it? Why couldn’t Bail Organa have said Jyn’s lines, or Mon Mothma? Answer: Jyn is the main character and needed to do so in order to demonstrate her character growth. Maybe I am too biased in favour of the characters established in the original trilogy (and even the prequels). I found it very hard to feel attached to Jyn Erso or Cassian Andor. Or even Chirrit Imwe or Baze Malbus or Bodhi Rook. The droid K-2SO was rather likeable, but he’s the only one of the main motley crew whom I liked. I didn’t hate them, and indeed they could be quite amusing in some scenes, but overall I was apathetic towards them. I didn’t mind that they all died in the end. Only K-2’s demise made me feel sad. I had the same issue with the earlier half of the movie that I have with so many other movies these days – it’s too dark. Not thematically dark, but literally dark. Visually gloomy. Everything is gritty and dirty. Almost monochrome. Browns, greys, dull blues and reds, black and white. It’s the modern trend for production design, I guess. I think one thing I liked about the earlier Star Wars movies – the originals and the prequels – was that they rarely went to that level of “realism.” They were generally brighter-toned, which contributed to the air of fantasy (appropriate for a space opera). This one, like so many other movies today, just likes to show you the dirt and grime. When we meet the adult Jyn, she’s in an Imperial prison cell. But we never find out why. She’s referred to as a criminal but that’s all. We’re never told what she did to land herself there. Did she kill someone? Did she steal stuff? Or was she just rude to a stormtrooper? Who knows… It was an odd gap in our knowledge of the character. It was hard for me to sympathise with Cassian Andor. His first scene shows him talking to a fellow rebel or informant, who gets all jittery, and when stormtroopers close in on them, Cassian kills his informant, who has an injured arm and can’t climb up a ladder to escape. That’s our introduction to Captain Cassian Andor. With that sort of introduction and no detailed backstory like Jyn’s, it becomes difficult to feel for him. Cassian improves with acquaintance. haha. I liked him a little better after the second time, but still, he’s no Luke or Han. So… The archives on Scarif. Tarkin casually blew up the place at the end. If that was the Empire’s only or main archive, wasn’t that a terrible idea? If it wasn’t the main archives, then did they really have to go to Scarif in particular to get the Death Star plans? A little change in dialogue would’ve gone a long way. Say that Scarif is the closest, or that Scarif is the least heavily-guarded, and it kind of makes a little bit more sense. It was implied the citadel at Scarif was the main (if not the only) archive, which then makes Tarkin’s destruction of it unwise, to say the least. Lots of little loopholes or weird plot points appear when you actually think about it. (Why is there a “master switch” sitting outside, unprotected, on a beach? If they needed the master switch turned on, does that mean the Imperials themselves had no communications going at that time?? How did Jyn know she was sending the Death Star plans to the right people – she didn’t even alter the frequency/channel? Was she just sending it out on like, an open channel?? And what was the point of Bor Gullet? Bodhi Rook seemed to recover pretty quick from his experience with that thing. If they needed so much kyber crystal from Jedha, wasn’t destroying the old city a really really bad idea? Where the heck is Vader’s tower supposed to be? It looks like Mustafar but that would seem… a bit weird. Why would Vader want to live in the place where he lost all his limbs?! For a blind guy, Chirrut Imwe has no problems walking or running around…) But in defense of the movie, this is really not a problem unique to Rogue One, or even to Star Wars. Many, many others have little loopholes and illogicalities that we excuse in the name of story. It is greatly to the filmmakers’ credit that loopholes in the third act are easy to overlook or set aside in the excitement generated by the action and events in that part. I would lump the first two-thirds of the movie here. While the pace wasn’t sluggish, it was… Average. Not horrible, but not great or very memorable either. Standard movie fare. Michael Giacchino produced a decent score, but oh, I wish John Williams could score every Star Wars movie! Unfortunately, some things can’t be digitally recreated – like talent and uniqueness. Giacchino is talented too, and I like many of his movie scores, but the ultimate movie music composer for me is John Williams. I wish JW and Giacchino had switched places. It would’ve been great if JW had scored Rogue One and Giacchino The Force Awakens, since JW seems to ‘belong’ to this one more. Ok, I’m going to go with the side that says they should have recast Tarkin altogether instead of doing this CG version. The skin is too smooth, the overall facial movements not quite natural, and the voice is less convincing the second time around. Day and Edge both pointed out that they actually had someone play Tarkin at the tail end of Revenge of the Sith so it’s not as though it was impossible. They should’ve gone with that actor, or found someone new. They recast Mon Mothma and Dodonna, after all. So the CG Tarkin just seems pointless now. The recreation of Princess Leia at the end? The Leia fan in me was really happy to see Leia get a moment of screentime, but it wasn’t nearly as convincing as the Tarkin recreation. 90% convincing, maybe, because it was just a brief glimpse of her face and it’s easier to fool the eye in a shot that lasts mere seconds. (I’d say the Tarkin one was 95% convincing.) In a longer scene it would hever have worked. Even in that brief glimpse I got the feeling that the face was a fraction too thin and the overall effect a little overdone, rather like the de-aging of Orlando Bloom for Legolas in the Hobbit movies. On one hand, I’m quite happy they kept romance out of the story. On the other hand… I think I would have been okay with something of the sort. There were actually a number of scenes where the staging made me think that there was some sort of romantic undercurrent between Jyn and Cassian. I thought I’d imagined it the first time, but after a repeat view, it seemed more obvious. I wonder if it had been part of the original story, but they decided to cut the romance out, leaving only the suggestive (but non-conclusive) shots behind. Hmmm. Now I wish they’d included a tiny romantic subplot. Heh. Krennic is the bad guy, and is certainly cruel, but you almost feel sorry for him with all this bad luck. While the first two-thirds of the movie were of average quality, the last act caused a dramatic shift in my experience of the movie. It felt as though they’d changed gears all of a sudden and veered hard right. Suddenly, it felt like Star Wars. Or, to be specific, it felt like the final act of the the original Star Wars movie. And parts of Empire Strikes Back. And parts of Return of the Jedi. And even parts of Phantom Menace and Revenge of the Sith. You have Jyn and Cassian trying to steal the Death Star plans from the Imperial archive on Scarif, while their merry band of rebels cause mayhem outside and draw the eyes of the Imperial garrison. The small-scale drama escalates about tenfold when some of the Alliance fleet drop in and attempt to assist and find a way to open the planetary shield gate. Result? One subplot that reminds you of Luke, Han and Chewie sneaking onto the Death Star, one subplot that’s reminiscent of the Ewok distractions on Endor, and another that’s just all-out space battle like Luke’s Death Star run or the dogfights and starship face-offs of Episodes I, III, IV, V and VI. And towards the end of all this, Tarkin and Vader drop by with the Death Star. It’s Yavin 4 and Hoth and Endor and Coruscant and Naboo all in one. 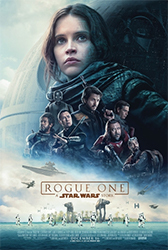 I felt exhilarated watching it, which says a lot in itself, because (1) the ending was a foregone conclusion (any Star Wars fan would have expected that) and (2) I did not feel particularly fond of any of the major characters in this movie. So to get me interested and excited despite all that? That’s an achievement. That did not happen with the vaunted The Force Awakens, which had the additional benefit of having Leia and Han and Luke appear in it. I attribute a lot of my positive feelings for this climactic part to the starfighters. X-wings! Y-wings! Red squadron! Gold! Oh look, there’s a Blue squadron too. (And Red Five’s demise is highlighted on purpose, I’m sure, since that ended up being Luke Skywalker’s callsign in A New Hope.) I was just reminded so so strongly of the original trilogy. A job well done indeed, since this story leads directly into Episode IV. I thoroughly enjoyed seeing established characters appear, even when they had extremely limited speaking lines. Mon Mothma! Bail Organa! And hey, General Dodonna too.3 Even seeing Tarkin was fun. Vader too. Threepio and Artoo had a little throwaway scene, appearing just long enough for Threepio to say one line. haha There was also that guy from the Mos Eisley bar and his friend; the scene was absolutely a foreshadowing to the events on Tatooine. I really really liked the little conversation between Mon Mothma and Bail Organa, where they acknowledge that war is inevitable and he goes off to Alderaan, promising also to send her to recruit “his Jedi friend” to the cause. I would’ve liked more of these two. That last scene is one of the best scenes of the film. Not because of the Leia appearance, but because the buildup within that scene alone was intense. The crewmen hurrying to download the Death Star plans, their horrified realisation that the door is stuck and they’re trapped… Then the blackout. Silence. Ominous breathing sounds. A familiar buzz and the red light of Vader’s blade illuminates the corridor. Panicked blaster shots, all deflected. Men flung aside with a wave of the hand, one is pinned to the ceiling. The door won’t budge farther than a few inches, and the man holding the precious datacard hurriedly hands it over to the guy on the other side through the small opening: “Take it!” The next man stumbles down the short corridor as Vader cuts through the door. All but hurls himself over the threshold of the next door and then it shuts, leaving Vader behind, with other hapless crewmen. A slam of a button, a frenzied cry of “LAUNCH!” and then the Tantive IV breaks away. Vader watches grimly. If the movie had ended with the wide shot of the ship disappearing into hyperspace, I would still call it one of the best scenes of the movie. The pace and the tension had me at the edge of my seat. Vader comes across as truly intimidating, and you can feel the terror of the crewmen as they see the Emperor’s right hand man and they know they’re doomed. The frantic rush to get the information to safety, the hurried launching. Just about perfectly executed. 1 This brings up interesting discussions on the ethics and the necessity (or not) of such CGI work. 2 Parts were filmed on location in Maldives, so that should give you some idea of the feel of the place.